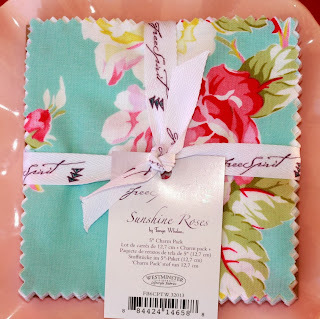 Quilt Taffy: Lottie Da ~ Sunshine Roses Giveaway Day! 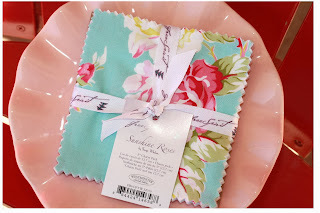 Lottie Da ~ Sunshine Roses Giveaway Day! A couple of pretties today. Sunshine Roses by Tanya Whelan. jelly design rolls and fat quarter bundles! It's also in the shop! Love that orange with it. 5" charm pack of your choice. What a lovely line! Thanks for the chance to win! I do realise this is a ladidda effort.....but I do love that Lottie Da fabric! Thanks for showing it of! I love the orange in Lottie Da, too, Corrie! Well Lottie Da I can't believe I'm still up and playing on the computer looking at your eye candy. I love both of those fabrics and would give my left Lottie Da to get my hands on some! Lottie Da Lottie Da, Im singing in this beautiful spanish morning! My friend has a daughter Charlotte whom we call Lottie Da!!! Great fabric! 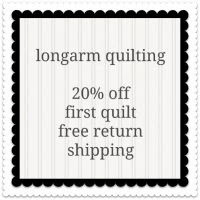 I will be making Lottie a quilt from this line! When I was a kid, and someone was acting sort of prissy, we would say "well Lottie Da, aren't you special" Love the name of this collection. Its the middle of the night... New baby...my PJs would make you say Lottie DA! I love the Lottie Da fabric! My five year old boy says 'well lottie da to you' when he wears his sassy pants! Thanks for the chance! Oh, you think you have better things to do than quilt? Well, Lottie Da! Aren't you special! Well Lattie Da, I like the Sunshine Roses line ! I love the purple in Lottie Da! It'd be a Lattie-Da-rned fun to win a charm pack of this beautiful fabric! Thanks for the chance. I'll go warm up my sewing machine right now. Lottie da I hope I win, ta dah! Isn't "Lottie Da, Lottie Da" a quote from the classic movie Annie Hall? Love the film - love the fabric. Thanks for the giveaway. "Lottie Da" is such a great way to say you are now leaving the room! I love flowers and the Sunshine Rose fabric is beautiful! Well, Lottie Da look at those beautiful fabrics. So Gorgeous. Thanks for the chance. Heather Bailey has long been a favorite. I would love Lottie Da, thank you! Lottie Dee, Lottie Da, life goes on: ohh! La la la la life goes on! It must have been fun to unpack Lottie Da for your shop! Ladida, Lottie Da would make me sing! 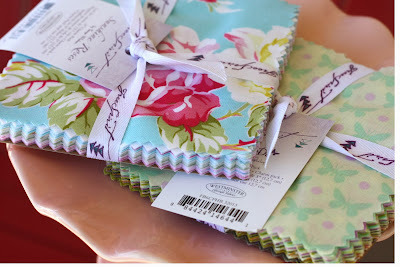 I was hoping to win one of the pretty bundles of fabrics from the previous giveways, but "Lottie Da" I didn't. Oh well. Maybe today will be my lucky day. I love the Sunshine Roses. Thanks for the chance to win. I'm at work, lottie da. Wish I was home sewing, lottie da! Lottie Da is lovely, I could come up with something in German, because da = there as opposed to hier = here, like I want Lottie Da to be here with me, but I doesn't work in English. Thanks for the chance anyway! Love your Lottie Da shop! Love the fabrics too! Thanks for the giveaway! 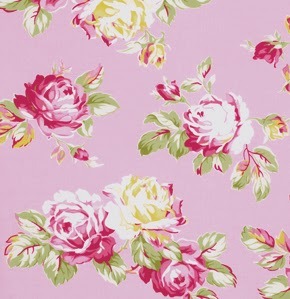 It would be a rosy Lottie Da day for me to have these lovely fabrics!!! Great giveaway....I am cleaning flower gardens out today....Lottie Da!!!!!!! Fun giveaway! My toddler is all "Lottie da" while I clean up after her today. Well Lottie Da, what a great giveaway! Love the Sunshine Roses :-) Thanks! 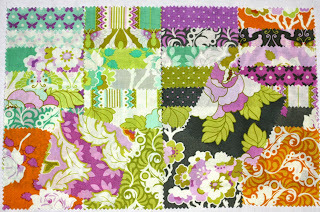 Freespiriit's Lottie Da by Heather Bailey has the perfect combination of colors and looks so cheerful. Lottie Da- ddi, I like to part-y-- no wait a minute, I Love this Lottie Da fabric, so happy and with such a wonderful purple! Well, Lottie Da it's going to be another beautiful day. 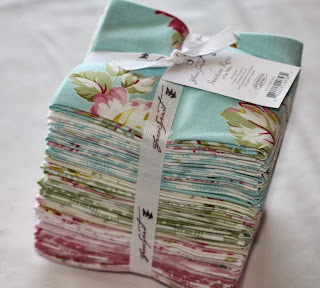 I love the Heather Bailey fabric. When my cousin is less than impressed by something someone has done -she will say "Well big old Lottie DA!" So you have a new hairdo, well lottie da. 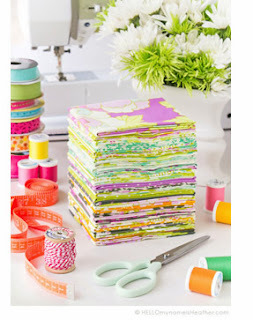 Well...Lottie Da....those are gorgeous fabrics! We called my youngest sister Miss Lottie Da - such airs she put on!! Today is a Lottie Da kind of day! Lots of sunshine and cooler temps! Well Lottie Da, I love this fall weather we are having and that fabric too! Lol I love this stuff! Lottie da goes the day while I wish I was playing with new fabric! Today is a Lottie Da day and tomorrow....is a Wicked day!! Well, Lottie Da! Isn't that the prettiest fabric you ever did see?! Thanks for the chance! My husband likes to brag about how easy it is for him to lose weight. Well, lottie da. When I'm having 'one of those days'... y'know when things just don't go right... I gotta remember to say to myself, "Lottie Da" and move on!! I am going on a cruise in December....lottie da! 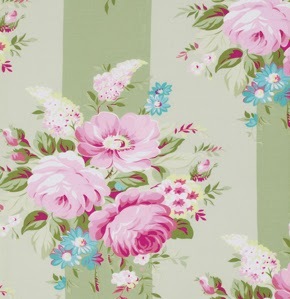 I always thought saying "lottie da" sounded snotty, but when referring to this fabric, it takes on a lovely new tone! Thanks for the chance! Well, lottie da, this is a great giveaway day. "Ooo-blah-de oo-blah da, life goes on, la-la la-lah la la lahhhh" - you know this catchy Beatles song -- try substituting "lottie da lottie da lottie dahhhhh" instead of all the la-lah la's!!! Makes it more fun! Both fabric choices are gorgeous. Very vintage looking. Well lottie da, I have a meeting in an hour (insert sarcasm!) Thanks for another great giveaway! What a gorgous collection Lottie Da is! I usually drink my Lottie Da in a cup! Love them! I have about five million things to finish by tomorrow. I am avoiding them all by looking at blogs so Lottie da! Oh, Lottie da, what lovely fabric! I prefer Sunshine Roses to Lottie Da - Just saying. HI, "LOTTIE DA" IS SO BEAUTIFUL! Lottie Da! I made it over here in time for your giveaway! Lottie da is about the opposite of how I'm feeling today. Big exam on Saturday, and I'm super nervous! I haven't said Lottie da in a long time. I used it as a kid - "Well, lottie da, aren't you special!" I was shopping with a quilt friend and got the last fat quarter pack of Sunshine Roses and she stuck her nose in the air and said "lottie da"!!! Well, Lotti Da is pretty, but Sunshine Roses is prettier. I would be SEW Lottie Da if I won the Sunshine Roses collection!!!!! 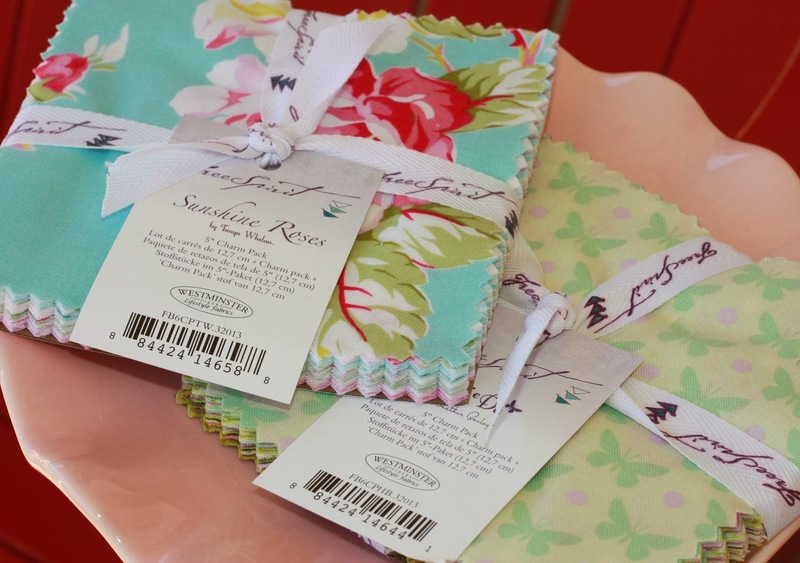 Both are lovely fabric collections, but I personally prefer Sunshine Roses to Lottie Da. When my sisters and I were young we used to call girls who acted snooty "Miss Lottie Da". Well, not to their faces, and not spelled that way, but you get the idea! Lottie Da makes me happy!! Thanks for a great giveaway. Well, lottie da. Look at that fancy blog header with the masks! Well Lottie Da, that's a great giveaway! Sewing with these fabrics would be great I could just sing "Falalala Lottie da"!! we skip we sing lottie da as we go! so bad i know but today it is foggy out side and my brain fells so lottie da foggy too. I went to school with a girl named Lottie Da, always went around with her nose stuck up in the air. I don't know why, but she always thought she was better than everyone else! It's a Lottie Da day! Such lovely give-aways. Thanks! oh, Lottie Da da da. I hope I win win win! Well, Lottie Da, what a wonderful giveawy. Sure do love the colors in Sunshine Roses. 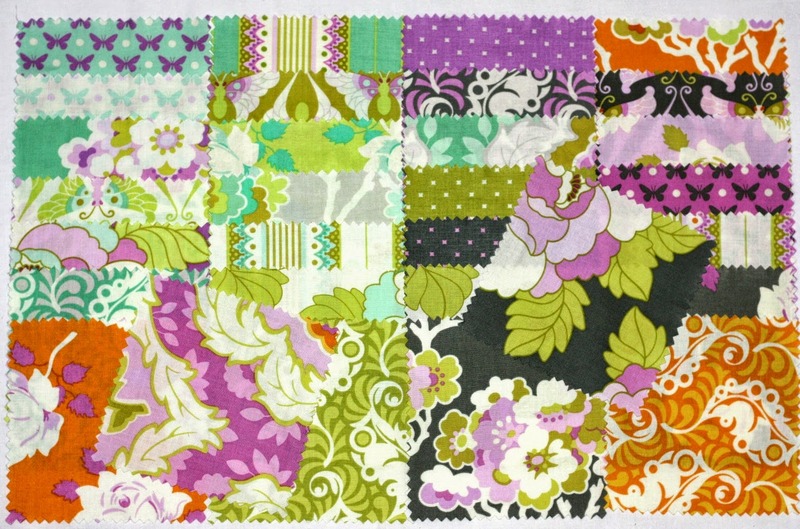 OHHH Lottie Da, gorgeous fabrics I need to have in my hands!! I will take Sunshine Roses for sure!! That's my favorite flower, and I missed her other line. Thank you for the chance to win!! Sunshine Roses call my name.Thanks you for the chance to win! Well, Lottie Da! You are a smart cookie! There is a lottie da say about these two collections! They're butiful! Can't grow roses? Well, Lottie Da, who cares when there is this beautiful Sunshine Roses material. 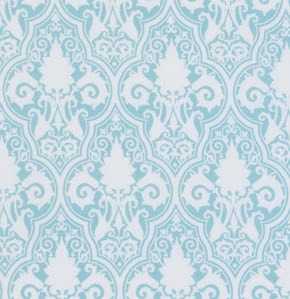 I love the turquoise in lottie da! did you see that dress on Prince George yesterday. wasn't it was so Lottie Da!! 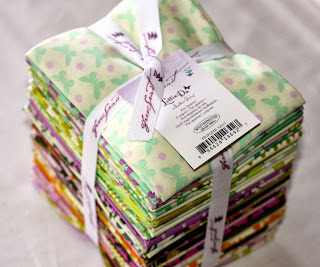 I love the greens and purples in the Lottie Da collection. Thank you for the give away. I can't wait to win, but if I don't, oh well, Lottie Da. Lottie Da isn't la di da at all - it's gorgeous! Well, the only thing I have to say about that Lottie Da fabric is that it's name fits it well. It has attitude! "Obla dee, Lottie da, life goes on, rah! La, la how the life goes on...!" Not quite the Beatles, but...! Many thanks! Lottie da,those sunshine fabrics are pretty! I hope I win the Lottie Da fat quarters. I'd sure be in a Lottie Da mood and I'd just have to say "well, Lottie Da to you too!" Well, Lottie Da, I would love to win you! "Well, lottie da, as if I really care who you are." Some beautiful fabrics you've shown us. Sunshine Roses really grabs me. Women will be so envious from what I make with this line of fabric they will turn up their noses and say, "well Lottie Da" tartly. I love this fabric. It dropped my jaw. What's the name? Why, it's Lottie Da! She always acts like she is so Lottie Da. 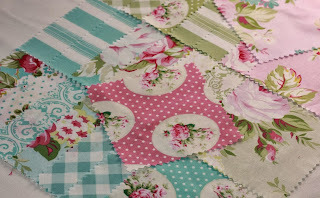 Love that Lottie Da fabric!! The colors are to die for. Would love to make a table runner or lap quilt out of it. Thanks for sharing. 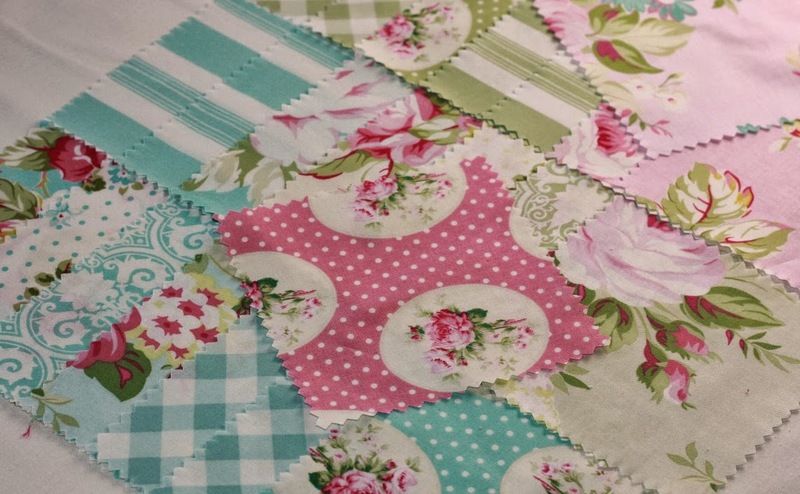 well lottie da, aint that just the sweetest fabric you ever did see? I would be in "Lottie Da" heaven if I won this! It's gorgeous! Well, I said, Ladeda, like her shoes were the only pretty ones. Love the colors of the fabric. This is a sentence that my daughter actually said. Well Lottie Da, isn't Tanya's Fabric just too special!! Lottie da, I have a three day weekend!